Even with the best care and attention, any timber on the outside of your property can deteriorate with age - the great British weather sees to that! 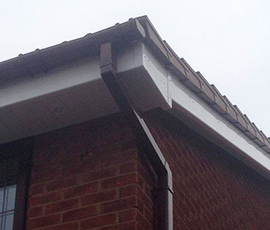 Soffits, fascias, bargeboards, cladding and even guttering suffer; leaving your roofline areas looking a little tired or shabby. PVCu roofline products from Azza's Roofing Services are available to replace these areas of wood. These never need painting and are virtually maintenance free. Add to this their durability and long term guarantee, and you might wonder why you have not replaced your property's external wood before. Some have chosen to 'overclad' their existing wood with PVCu products. This is neither prudent nor cost-effective as the wood will still deteriorate and rot. Azza's Roofing Services remove the timber completely and replace it with PVCu which is available in a range of colours to match your property's character or your preferences. Call us to get your free, no obligation quotation.